LinkedIn is by far the most important professional networking site and not having one will severely reduce your chances for an interview. According to U.S. News & World Report (2017), nearly 95% of recruiters utilize LinkedIn as a major sourcing tool to find and vet candidates. Your LinkedIn profile is essentially an extension of your resume with two exceptions. First, a LinkedIn profile will have a professional headshot picture for recruiters to see. Think of your headshot as the face of your brand. Second, a LinkedIn profile isn’t limited to a two-page resume format and may include projects completed, professional associations, volunteer work, publications, patents, skills endorsed by others, and other information that presents a more complete branding of you. The most important aspect of LinkedIn is that it’s the best way to network with people and apply for jobs today (2018). 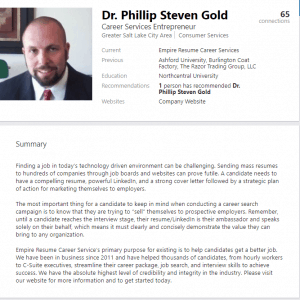 This article will outline the best way on how to write a great LinkedIn profile. The first thing people see when they view your LinkedIn profile is your profile photo. Many recruiters won’t even consider a candidate if they don’t have a photo since this is their pre-screening before inviting you for an interview. LinkedIn (2017) highlights that adding a professional photo on your LinkedIn profile can result in 21x more profile views. Think of your profile photo as your brand since this is a recruiter’s first impression of you. Your photo should be a headshot taken as if you were sitting across an interviewer’s desk. Wear what you would wear to work and ensure that you are well-groomed. Also, choose a background that isn’t detracting from your photo. Avoid using any photos that diminish your professional brand such as pictures of you engaging is leisure activities or with your family/friends. You will automatically be provided with a public URL once you setup your LinkedIn profile. You can easily customize your public URL to make it easier to find you and more memorable. For example, a standard assigned LinkedIn public URL may be “linkedin.com/pub/phillip-gold8987/522785.” This can easily be changed to something much easier to remember like “linkedin.com/in/phillipgold.” You should always include your LinkedIn URL as part of your contact information on your resume to make it easy for recruiters to view your profile. Your LinkedIn summary is a key element of your personal branding. Your summary should be compelling and reflect your experience and the value that you can bring all within the 2,000-character limit. Your LinkedIn summary is very likely to be read and you want to capture the attention of the readers. 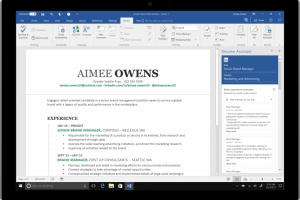 Your summary is the first impression that many recruiters will see. Having a hasty summary or not having one at all could be detrimental to your job search. It’s best to write your LinkedIn summary in the first-person “I” singular form since it makes it more personal. You can also include any media to your summary such as a link to a website, an article you wrote, a video you produced, etc. Click here for an article that specifically walks you through how to create a LinkedIn summary. After the LinkedIn contact information with your photo, headline, URL, and summary, LinkedIn is laid out with three primary profile sections. First, the Background section includes your work experience, education, and volunteer experience. Second, the Skills section includes all the relevant skills that you can include pertaining to your role. Third, the Accomplishments section includes your publications, certifications, patents, courses, projects, honors & awards, test scores, languages, and organizations. Your experience should be consistent with the information from your resume to avoid making anything confusing to recruiters. The most important factor when including your experience, both on your resume and LinkedIn, is to remember that your experience should not only include your primary job functions but clearly highlight your achievements and the value you bring. You should include quantifiable results and showcase why you are a great candidate. An easy way to do this is to include a separate section under your primary job functions that specifies your achievements with measurable results. As with your resume, you only need to go back 10-15 years to avoid any age discrimination. Including your education is another key element of a LinkedIn profile and greatly increases your chances to be seen. Additionally, including your educational information provides opportunities to connect with other alumni that may be working in industries that you are interested in. If your education degrees were more than 15 years ago, you can leave off the dates as to also avoid age discrimination. This section is straightforward and is where you will include any volunteer work, both past and present, that you’ve done. The volunteer section is not something that most people include on their resumes unless it is directly relevant to their job at hand or helps them in getting an interview. LinkedIn is distinguished in that it allows you to include your volunteer experience which paints a more complete picture of who you are. The skills you include in your LinkedIn are part of the keywords that recruiters use to search for candidates. You can add numerous skills that will help you become more discoverable. Include the skills that you’ve already listed on your resume (if you’ve listed them) in addition to listing as many skills that are associated with your current job and job descriptions that you’re considering. Endorsements enhance your credibility and show that other people also agree with your expertise with a particular skill or skills. Endorsements are like votes of confidence from other people in your prowess with a certain skill. The right endorsement can go far in establishing your professional brand. The more endorsements you have, the more discoverable you will be. Recommendations provide specific details that highlight someone’s ability and the value they can bring. Recommendations are like brief recommendation letters that recruiters can immediately see on your LinkedIn profile and bolster your credibility. Recommendations are considered high-quality trust signal by recruiters. Seek to receive and give recommendations to your friends and colleagues as well. 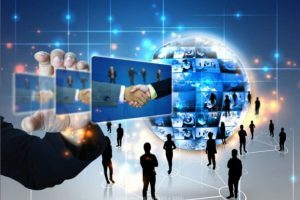 The best way to receive endorsements and recommendations from others is to connect with as many people as possible. Connections are how you network with people on LinkedIn. At a minimum, you should be connected with your colleagues and try and reach out to other people in your industry working at other organizations. 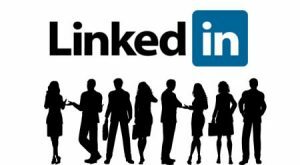 Click here for an article that specifically walks you through how to use LinkedIn for networking. The accomplishments section is very straightforward and includes any publications, certifications, patents, courses, projects, honors & awards, test scores, languages, and organizations that you may be part of. Many of these sections may not apply to you so can leave them blank. The main ones that most clients will have are certifications and honors & awards. There are many jobs today where a certification is necessary or very advantageous, so listing them here will make you more marketable. The honors & awards section can include any type of awards or recognition you’ve received that are directly relevant to your professional life. The patent section is very specialized and only applies to a few select professions where producing patents occurs. The project section is a great place to showcase any projects (if applicable) that you’ve led or were part of. The publications section is like the patent section, where it is very specialized and only applies to a few professions. Courses are a good place to list any additional education directly related to your profession. Test scores usually applies for recent graduates or those candidates still in school. The languages section is good to add any foreign languages that you are competent with. Finally, the organizations section is where you will include any associations that you are part of or work with in any capacity to show your involvement. LinkedIn has five levels of profile competition: 1) Beginner, Intermediate, Advanced, Expert, and All-Star. The levels of completion are based on how many key sections of LinkedIn are completed. 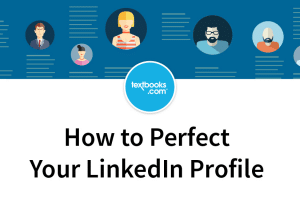 According to LinkedIn (2016), people with an All-Star profile status are 40x more likely to receive opportunities including job offers, new clients, new markets, and news connections. 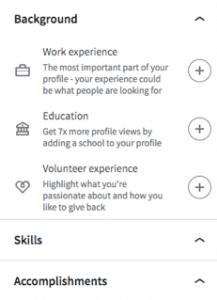 There are seven elements that need to be completed to reach an All-Star level: 1) a profile picture, 2) work experience, 3) at least (5) skills listed, 4) a LinkedIn summary, 5) your industry/location, 6) education, and 7) at least 50 connections. 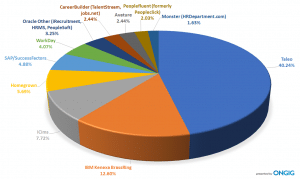 Only 51% of LinkedIn users reach an All-Star level. LinkedIn is the most powerful professional networking tool available today (2018). LinkedIn is like your online resume but expands much further into your professional brand, which allows viewers to get a more complete picture of who you are. LinkedIn not only allows you to connect with people, it is a great place to apply directly for jobs versus just using job boards and company websites. Finally, LinkedIn is the best place to target decision makers at companies, which allows you to address your resume/cover letter to directly.